When you send an email campaign, you can monitor the results by checking the statistics. In the campaign you want to use, click more stats. Note: Clicking the Stats button shows the stats for the most recent mailing of a campaign. In the left pane, click any stat type to view combined statistics for all mailings of the campaign. The following table will help you better understand each statistic. Accepted These contacts received your email successfully. 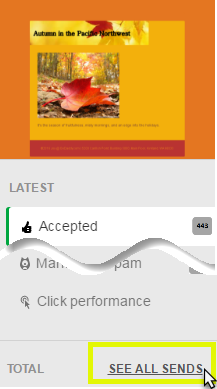 If they opened, clicked links, or forwarded the email, that would show in the "Engaged" and "Viewed" stats. Bounced These contacts did not successfully receive your mailing. Viewed These contacts opened your email. Engaged These contacts clicked a link, or shared your email using forward to a friend, or a social share button. Forwarded These contacts forwarded your email to a friend. Growth Measures the total new subscribers and unsubscribers that resulted from your mailing. Marked as Spam These contacts reported your email as spam in their inbox. To view results of multiple mailings in the same campaign, click the See all sends link in the bottom, left pane of the Statistics page. Click performance visually maps the strength of each URL in your campaign. 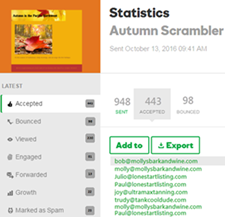 GoDaddy Email Marketing distributes the total number of clicks for a specific mailing over all active links in the campaign. Each URL shows the total percentage of all clicks it received, along with the unique and total click counts.